Forex (or FX) means foreign exchange. What exactly does this involve? Exchanging one currency for another – it’s as simple as that. With a daily turnover of over 5 trillion US dollars, the Forex market is the largest financial market in the world. 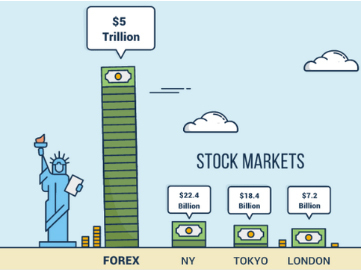 As a comparison, New York Stock Exchange only has 22.4 Billion US dollars as average daily trading volume. The forex market is open for 24 hours, 5 days a week – Monday to Friday. Trading begins with the opening of the market in Australia and continues to Asia and Europe, followed by the USA until the markets close. How Do I trade on Forex? Generally traders and investors buy (long position) the financial instrument when they think the value of it will increase, or sell (short Position) when the expectation for the value is to decrease. Forex Traders do both simultaneously. For example, opening a long position on EUR/USD currency pair means buying Euros and selling US dollars at the same time. In the currency pair, the currency on the left is called the BASE currency. This is the currency you wish to buy or sell; the one on the right is the QUOTE currency, and is the one you use to make the transaction. What are the most popular currencies? So called "The Majors" are the most heavily traded currencies: EUR (Euro), USD (US Dollar), JPY (Japanese Yen), GBP (Great British Pound), AUD (Australian Dollar), and lastly CHF (Swiss Franc). PIP is a very commonly used term for forex traders and stands for "Price Interest Point”. This is the basic and most important unit of measurement in forex. PIP usually refers to the 4th digit after the decimal point in the price of a currency pair. Spread is the transaction fee while trading on currencies. The broker executes a trade at a slightly higher Buying price and lower Selling price than the actual market rate. Therefore the difference between the selling (bid) price and Buying (ask) price is called spread and it is measured in PIPs. Leverage allows individual investors to trade on Forex market without high capital. Merit Forex gives traders leverage of up to 400 on currency pairs. This means that trader's account balance is multiplied by 400 to open a trading position. 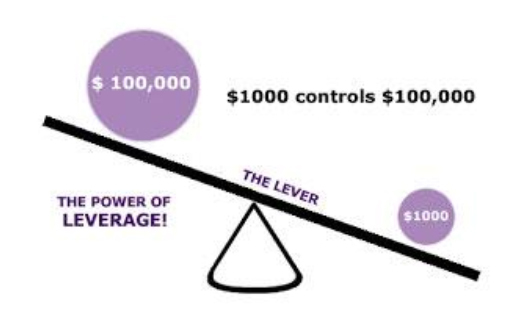 Without leverage trader needs to have minimum $100,000 on the account to open a trade of 1 lot. With a leverage of 100 on the account as an example, trader can buy 1 lot of a currency with only $1000.